The Senegalese poet Birago Diop once wrote that the dead are not really dead. They live on in the wind, forests, and rivers, their pleas for justice echoing among the living. So it is today in the Democratic Republic of Congo, where more than five million people have been killed in the world’s deadliest conflict since World War II. But the calls for justice by the dead and the living have been repeatedly muted in several classified or sanitized United Nations reports, all to protect a handful of powerful—and likely guilty—parties in the supposed interest of peace and stability. Today, the international community finds itself at a crossroads concerning Congo. In late August, a draft report by the U.N. High Commission for Human Rights was leaked to the French newspaper Le Monde. It documented more than 600 incidents of gross human rights violations by Congo’s warring factions and their allies in Rwanda, Uganda, Angola, Zimbabwe, and Burundi. Amid the more serious allegations, the report accuses Rwandan Tutsi soldiers and their allies in Laurent-Désiré Kabila’s rebel alliance of committing war crimes, crimes against humanity, and alleged acts of genocide against tens of thousands of Hutus in Congo. Some of the victims were génocidaires from Rwanda, but others, including women and children, were not. The allegations of massacres of innocent Congolese Hutus—who were targeted because they were the ethnic kin of the murderers in Rwanda—are especially damning. Clearly, these crimes, many of which occurred in the aftermath of the Rwandan genocide, complicate the standard narrative of that genocide, which in turn threatens the strong support that Rwandan president Paul Kagame continues to receive from the Western donor community. The Rwandan government objected loudly and forcefully to the leaked report. The tiny nation at first threatened to recall all its 3,500 troops currently serving as U.N. peacekeepers, mostly in Darfur, then recanted the threat. The leak set off an intense debate among policymakers, human rights advocates, and civil society leaders about how best to address the official report, which was subsequently released on October 1. The Rwandan government’s fear is understandable: The country stands to lose more than perhaps any other actor from this report, and it may well experience a rupture with the U.N. and the larger family of nations. But it is imperative that the international community call Rwanda’s bluff and prosecute those criminal elements within its army, as well as among Rwanda’s Congolese allies, who committed these gross violations. However organized and disciplined, an army that has committed war crimes and other crimes against humanity should not serve under the banner of the U.N. Unlike the Rwandan government, Congo’s government under Joseph Kabila issued a tepid response to the report and has kept a lower profile over the accusations. As with Kagame, the report challenges the peacemaker image that Kabila has cultivated within the international donor community. A former warlord, Kabila once served in the Rwandan army and commanded Rwanda-backed rebel units in some of the areas cited in the report. Later, he served as deputy to then Colonel James Kabarebe (now a general), Rwanda’s current minister of defense, who commanded Congo’s army under the country’s late president Laurent-Désiré Kabila, father of the current president. Given the bonds that once existed, and to some extent, continue to exist between the governments of Rwanda and Congo, the report could implicate not only Kagame and his officers, but also Kabila and the coterie of warlords and human rights violators now serving with flagrant impunity at the highest levels of Congo’s government and security institutions. Like the Kagame administration, the Kabila regime enjoys unprecedented support from Western donors. Above all else, the mapping report underlines the pressing need for an international criminal tribunal for Congo. Model post-conflict countries, such as Liberia, the former Yugoslavia, Sierra Leone, and South Africa, have benefited from either an international criminal tribunal or a robust truth and reconciliation process, or both. It was the Special Court for Sierra Leone that indicted Liberia’s Charles Taylor for war crimes and crimes against humanity, and paved the way for peace in both Sierra Leone and Liberia. A similar court for Congo will provide redress for the victims, induce real peace and stability, and accelerate regional economic integration. Congo is stuck in a violent cycle of conflict, corruption, and public mismanagement, which has created a paralyzing crisis in political leadership at the national and international levels. Until the grievances mentioned in the report are addressed in an appropriate forum for justice, Congo will not know peace. 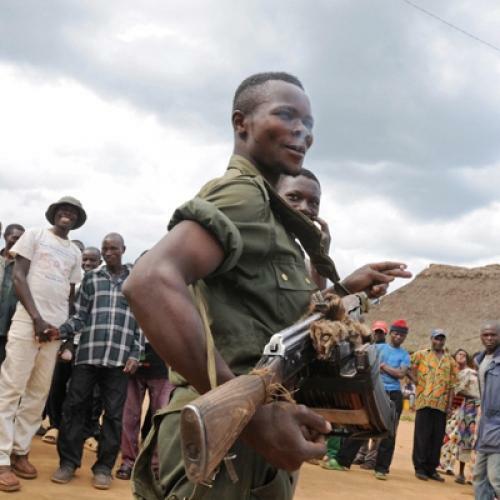 Congo is the broken backbone of Central Africa and needs to be treated accordingly. In such dire cases, there is no substitute for justice. Mvemba Phezo Dizolele is a distinguished visiting fellow at Stanford University’s Hoover Institution and an African Studies visiting scholar at Johns Hopkins University School of Advanced International Studies. He is the author of a forthcoming biography, Mobutu: the Rise and Fall of the Leopard King.